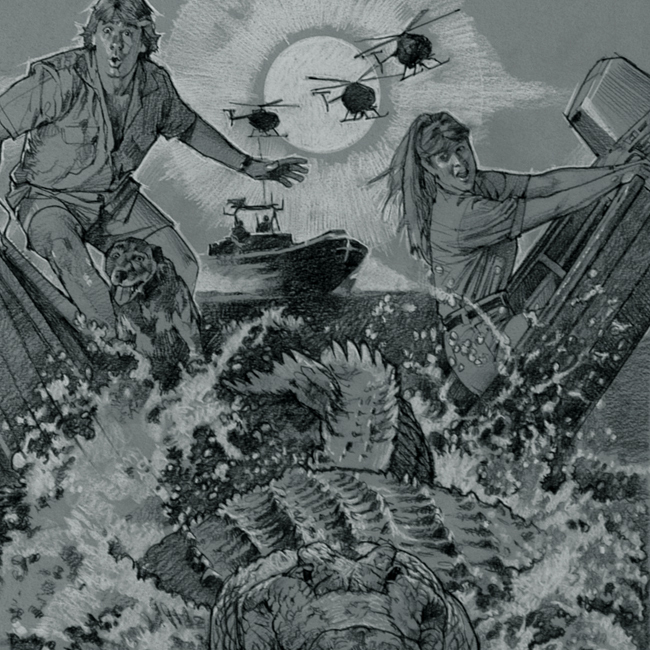 In the movie the Crocodile Hunter mistakes some CIA agents for poachers and sets out to stop them from capturing a wily croc which, unbeknownst to him, has swallowed a tracking drone. Stephen Robert Irwin (22 February 1962 – 4 September 2006), known simply as Steve Irwin and nicknamed "The Crocodile Hunter", was an iconic Australian television personality, wildlife expert, and conservationist. He achieved world- wide fame from the television program The Crocodile Hunter, an internationally broadcast wildlife documentary series co-hosted with his wife Terri Irwin. Together, they also co-owned and operated Australia Zoo, founded by his parents in Beerwah, Queensland. He died in 2006 after his chest was fatally pierced by a stingray barb whilst filming in Australia's Great Barrier Reef. Signed and dated bottom right outside border "drew 2002"